Made of Thick wire/Stainless Steel with rectangular Jaws lined with Insulation/Gripping material. It can hold falsk from 100-2000 ml. FLASK TONG: Made of thick wire steel chrome plated 12 long. We are counted amongst the prime Flask Tongs Manufacturers and Suppliers based in India. 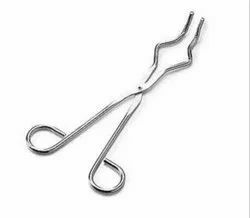 We manufacture Flask Tongs from optimum quality M.S and S.S. round bar. 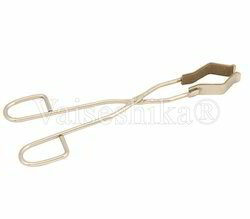 These Flask Tongs are available in various sizes meeting diversified demands of the clients. Clients can avail Flask Tongs at market leading rates from us. We are a well-renowned organization in the industry to provide our patrons the best quality array of Stainless Steel Flask Tongs. wrapped with heat resistant yarn. Backed by rich industry experience and market understanding, we are involved in offering a wide array of Flask Tong to our valued patrons. Beaker Tongs SS made of SS, 12" Long. We are involved in offering excellent quality Flask Tong to our most valued clients. Our offered Anatomical Model is widely appreciated by our clients which are situated all round the nation. We are Leading Manufacture And Supplier in Flask Tong(OE-FTN). FLASK TONG MADE OF DAI PRESSED STAINLESS STEEL ROD, FRONT MADE OF STAINESS STEEL SHEET COVERED WITH ASBASTO.